We grow a variety of fruits and vegetables which are sold directly on the farm, at local farmers’ markets, and in wholesale quantities to our commercial customers. Most of what we grow is sold as pick-your-own or pre-picked from our Farm Stand. We allow supervised children and adults of all ages to participate in all of our farm activities. 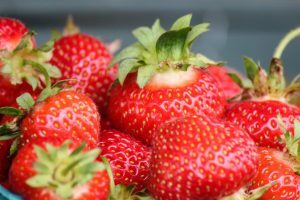 Strawberries are a tasty treat which ripen by the first week of June. Typically the Rhode Island strawberry season is four (4) to five (5) weeks, ending around the Fourth of July. Our summer varieties ripen at different points through the season so that we always have a great supply of fresh berries for you to pick. Don’t worry if you miss the main season! We now offer two new varieties which will be available in limited quantities throughout the summer and into the fall. Our season is at it’s peak production around Father’s day. Plan to visit near the middle of the season for the easiest picking. Strawberries do not ripen once picked. Please pick the ripest berries you can find. We have container sizes including pints, quarts, and 6 quart flat boxes; and you’re welcome to bring your own container. We have fresh sweet corn for sale at our farm stand and to wholesale beginning around the end of July and continuing until the nights begin to frost in October. We hand pick fresh bags of sweet corn each morning, as well as throughout the day to always keep a fresh supply on the stand. We grow a fall variety of Raspberries which ripen in August and will continue producing fruit until a killing frost which usually occurs in October. We sell pre-picked half pint containers available on our farm stand in Johnston, RI and at the Farmers’ Markets we attend. Pick-Your-Own customers are welcome to pick raspberries. Please call first to check field conditions. Open daily during the fall season for Pick-Your-Own pumpkins and various other fall activities. 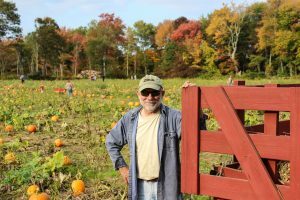 Our hayrides will take you and your family out to the pumpkin patch where you’ll find sizes appropriate for small children, and larger pumpkins perfect for carving Jack-O-Lanterns or painting. Make sure to check out our activities page and our corn maze if you come to visit us during the fall! 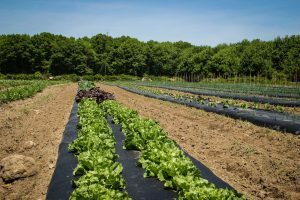 A large variety of fresh fruits and vegetables are grown right on our farm in Johnston, RI. Our produce includes lettuces, tomatoes, onions, broccoli, egg plant and many other fresh vegetables on a seasonal basis. Seasoned hardwoods, locally harvested off of the farm. We have quality first & second cuts, timothy & orchard grass. Quantity and off the field discounts available. Please call for current pricing and availability.